The first textbook on analytic geometry was written in Latin by the Dutch statesman and mathematician Jan de Witt. It is entitled Elementa Curvarum Linearum, Elements of curves, and consists of two volumes. The first volume, liber primus, presents the geometric generation of the conics. The second volume, liber secundus, deals with the classifications of quadratic curves. The second volume forms the core of the Elementa Curvarum Linearum, while the first volume only serves as an introduction. The basis for this textbook, which was first published in 1659, lies in the ideas that Descartes developed in his book Géométrie (1637). Albert Grootendorst prepared the English translation of the first volume, liber primus, which was published by Springer in 2000. In addition to the parallel presentation of the Latin text and its English translation, this includes a general introduction, a summary with a complete survey of the theorems (without proofs), annotations, and two appendices. This edition is partly based on the Dutch translation by Grootendorst, which was published in 1997 by the Centrum voor Wiskunde and Informatica in Amsterdam. The Dutch translation of the second volume, liber secundus, by Grootendorst, was published in 2003 by the Centrum voor Wiskunde and Informatica. This book has the same format as both the Dutch and English translation of the first volume: in addition to the text and its trans-lation, it includes a general introduction, a summary of the theorems, annotations, and an appendix. Grootendorst received much help from Miente Bakker in preparing the publication of both the Dutch and English translations. Due to his premature death in December 2004, Grootendorst was unable to complete the English edition of the second volume. At the time of his death, Grootendorst had almost completed the translation of the Latin text into English. His plan was to also translate the additional material of the Dutch edition into English. Jan Aarts completed the translation of the Latin text into English. Reinie Erné translated the additional material from the Dutch edition into English. Miente Bakker did the editorial work including preparing the index. The Latin text that is used for this edition of the liber secundus is taken from the second edition of 1863 by the publisher Blaeu in Amsterdam; we are indebted to K.F. van Eijk, treasurer of the library of the Delft University of Technology, for providing access to it. Many thanks go to Tobias Baanders of the Centrum voor Wiskunde and Informatica for the additional figures illustrating the introduction, summary and annotations. Grootendorst, A.W. (2010). 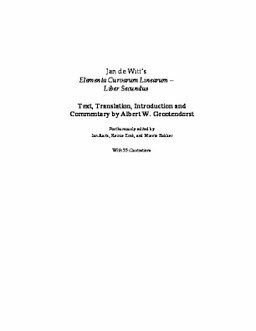 Jan de Witt's Elementa Curvarum Linearum Liber Secundus - annotated English translation from Latin. (J.M Aarts, R Erné, & M Bakker, Eds. )Sources and Studies in the History of Mathematics and Physical Sciences . Springer .